A detailed analysis of data downloaded from the U.S. Census Bureau and records released by the state Reapportionment Office shows just the opposite has taken place. Oconee County will be the minority partner in both of the districts of the House of Representatives into which it will be placed, the new District 117 and District 119. Clarke County will be the dominant partner in District 117 and 119 and the sole county in District 118. At present, Oconee County is the dominant county in the 113th House District, the only district in which it falls, and contributes 59.9 percent of the registered voters in the district. Clarke County is the sole county in House Districts 114 and 115 and the second most populous county in the 113th House District, which also includes parts of Morgan and Oglethorpe counties as well as all of Oconee County. The comparisons between the outcomes of redistricting for the two counties are dramatic. Only four in 10 of the citizens living in the new 119th will come from Oconee County, while Clarke County will contribute the remaining residents. Only two of every 10 residents living in the 117th District will come from Oconee County, while Clarke County citizens make up six of 10. The remaining residents will live in Barrow and Jackson counties. Oconee County remains whole in the 46th Senate District and once again is the only county falling entirely in that district, where it currently makes up 22.0 percent of the registered voters. Clarke did lose influence in the Senate, with the county split more than before between two senate districts. The analysis of the redistricting outcome in the House indicates how little of a role simple population growth actually played in the decision. Clarke County Rep. Doug McKillip, who was elected as a Democrat in 2010 and then switched to the Republic Party before the 2011 General Assembly session began, was able to convert his Democratic 115th House District into the new Republican 117th District. To do that, he shed parts of Clarke County, picked up parts of heavily Republican Oconee County, and added parts of Barrow and Jackson counties as well. Oconee County’s 113th District became the new 119th District, by assuming parts of McKillip’s old 115th. Clarke County’s 114th, represented by Keith Heard, a Democrat, simply got a little smaller and became the new 118th. He gave up parts of his old district to McKillip’s new 117th in the process. Oconee County was unrepresented during the redistricting process, with its House seat unoccupied during the crucial pre-session negotiations. Chuck Williams was elected only on July 19 in a special election to fill the vacant seat. Williams told citizens and Oconee County commissioners on Aug. 16 that he saw the new district maps only when they were released to the public on Aug. 12. The General Assembly met on Aug. 15 to take up redistricting plans drafted by subcommittees before the session began. Williams voted with the Republic majority in favor of the legislation creating the new districts. Those maps are now to be reviewed by the U.S. Department of Justice. The Justice Department will be scrutinizing the maps to make sure they meet the standards of the Voting Rights Act of 1965 and subsequent case law built on it. Section V of the Voting Rights Act says that states that previously created procedures to limit voting by Blacks had to demonstrate that any changes in voting procedures are free of racial discrimination. The U.S. Supreme Court in 1969, in a Mississippi case, expanded the definition of discriminatory voting practices under the Act to include anything that dilutes the impact of the Black vote. The racial composition of the Clarke and Oconee districts seems not to have been radically changed by the redistricting process. According to data released by the reapportionment committee, African-Americans are 17.9 percent of the new 117th District, 33.6 percent of the new 118th District, and 11.7 percent of the new 119th. The reapportionment office did not release the characteristics of the old district, but my analysis of voting registration shows the old and new districts are not radically different in terms of Black registration. The reapportionment office’s release of data relevant for the redistricting process has been spotty. I have asked for the maps for Clarke and Oconee county districts daily since Aug. 17. I was able to obtain the map for the three House districts only yesterday. I am still waiting on the map of the 46th Senate District. 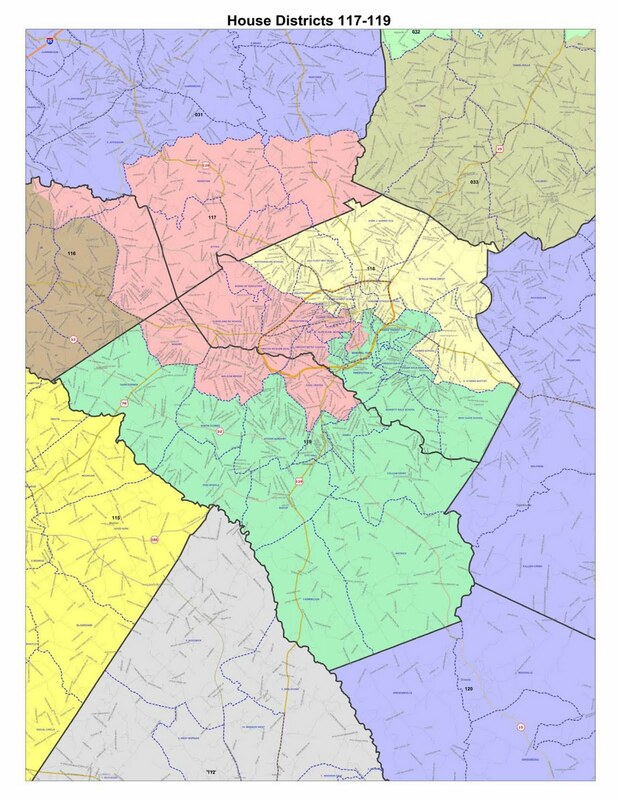 To better understand the district lines for the new 117th House District, in which I will be included, I downloaded the detailed Census Bureau data file for redistricting for Clarke and Oconee counties as well as the detailed Census maps that accompany and explain those data. It is a tedious process to match the Census data with the Census maps and then to match these data with the new district maps. The matching, however, shows that Oconee County, minus the three precincts of Athens Academy, Malcom Bridge and Bogart, has 22,494 residents. Those 22,494 residents will be 42.2 percent of the residents of the new 119th District, which will have 53,330 residents. Clark County will have the remaining 57.8 percent of the residents. The 10,494 Oconee residents of the precincts of Athens Academy, Malcom Bridge and Bogart will make up only 19.0 percent of the 54,352 residents in the new 117th District. Clarke County will contribute 32,815 residents, or 60.4 percent, and Barrow and Jackson will contribute 11,223 together. Population data are not the same as voter registration. Oconee County has very high registration, and my calculation, based on registration data from the Secretary of State office and data released by the reapportionment committee, is that Oconee County will have 49.8 of the registered voters in the 119th District and 22.1 percent of the registered voters in the 117th. Students, who make up a large part of the Clarke County population, often do not register or vote locally, but they count in the Census. The three precincts taken from Oconee County account for 31.4 percent of the county’s population and 32.2 percent of its registered voters. They also are some of the largest precincts in the county. An examination of the Census data shows how the district lines were created and gives some sense of how many possibilities other than those chosen could have been exercised. 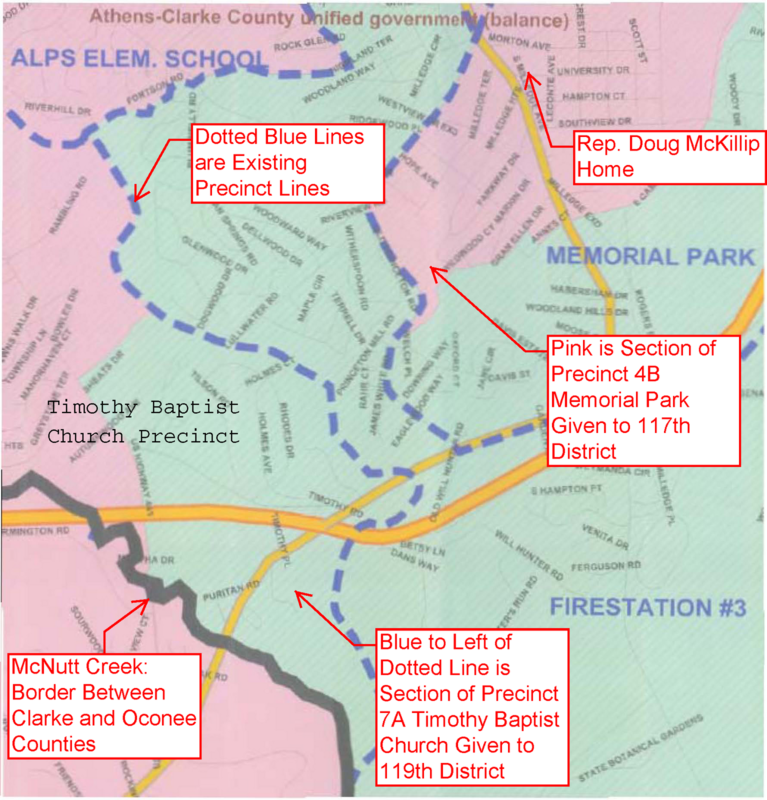 To create the 117th House District for McKillip, the map makers divided Clarke County Precinct 7A (Timothy Baptist Church), as shown in the map above. The division seems arbitrary without an examination of the Census Block maps. Those maps show that 18 individual Census Blocks were selected out of all of those in Precinct 7A and shifted to the new 119th. 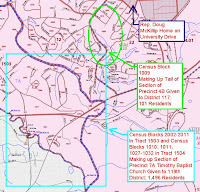 The remaining Census Blocks in the precinct became a part of McKillip’s 117th District. This is shown in the map below. Any one of these Census Blocks could have gone in the other direction. 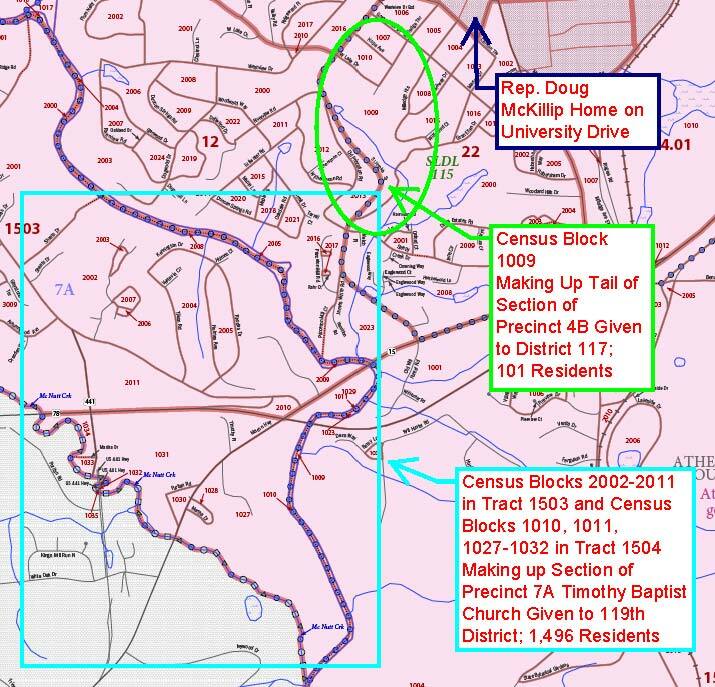 McKillip obviously needed to jettison the 1,496 residents from Timothy Baptist Church precinct for some purpose. Because a representative must live in the district she or he serves, the new 117th reaches back into what would seem to be more naturally a part of the 119th District to include McKillip’s house. McKillip lives on University Drive. 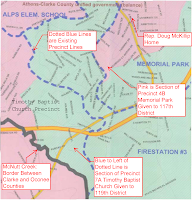 In fact, Clarke County Precinct 4B (Memorial Park) was divided so that most of the district was sent to the 119th, leaving only a part, including McKillip’s neighborhood, for the 117th. The map also reaches into the University of Georgia campus to grab dormitories on the main campus near the Georgia Center. The district picked up 598 residents in the process. The remaining part of the 117th has a funny tail that seems to make no sense unless one see’s the Census Block map. That little tail is Census Block 1009. It contains 101 residents who McKillip chose to include in his district. This readjusting of districts–shifting Census Blocks around--is done by computer programs and experts, who know the goals of those in charge of the process. I did my analysis manually on my computer with spreadsheets based on the data I downloaded. The Census Data are released for redistricting purposes by Census Blocks. Each address in a community is assigned to a unique Block. The experts also have access to voting records, which are organized by address. The voter record addresses can be matched to those from the Census Bureau. Since voters in Georgia do not register by party, no data on party affiliation are available by address. And if voter records are secret, as they are supposed to be, no data on actual vote are available by address. Estimates of how voters in the new districts will vote in the future have to be projected from precinct data from past elections. This is difficult in the few cases where precincts have been split, as in the case of the Timothy Baptist Church precinct. The reapportionment committee estimates that voters in the new 117th District voted 54.3 percent for Republican Gov. Nathan Deal in the 2010 election, that voters in the new 118th voted 29.4 percent for Deal, and that voters in the 119th voted 54.4 percent for Deal. My analysis of voting records for the old districts indicates that voters in the old 115th (McKillip’s district) voted 37.6 percent for Deal, voters in the old 114th District (Heard’s district) voted 28.1 percent for Deal, and voters in the 113th (Williams’ district) voted 62.1 percent for Deal. So by shifting voters around, including those in the Timothy Baptist Church and Memorial Park precincts, the architects of the 117th District converted McKillip’s district from a Democratic one to a Republican one. All of Oconee County has been in the same House district only since 2004. The current 113th House District combines Oconee with parts of Clarke, Oglethorpe and Morgan counties. The population of the state of Georgia, according to the 2010 Census, is 9,687,652. The state has 180 House districts. So the ideal size, to reflect the principle of one-person one-vote, is calculated by dividing the state population by 180, resulting in the goal of 53,820 residents per House district. Reapportionment is required not because of population growth but because of differential population growth. If every county in the state had grown at the same rate, it wouldn’t be necessary to change district lines. Oconee County’s growth rate since the last Census of 25.1 percent compares with a growth rate of 50.3 percent in Barrow County, 45.4 percent in Jackson County and 38.0 percent in Walton County. Barrow County, with a population of 69,367, is large enough to have its own district, and the 116th is entirely within its borders. Jackson, with a population of 60,485, also has its own district, the 31st, and Walton, with a population of 83,768, has the 115th. Clarke County, with a population of 116,714, is large enough to have two districts within its borders, with 9,074 residents left over to contribute to another district. But those two districts would be Democratic, and a reconfigured 115th entirely within Clarke County wouldn’t be likely to send McKillip back to Atlanta when he next faces voters in 2012. Other counties near to Oconee fared much better in redistricting. Madison, Oglethorpe, Greene and Morgan counties had growth rates below the state average, though Oglethorpe was just slightly lower. All of Oglethorpe and all of Greene are in the new 120th House District. At present, Oglethorpe is split between the 113th and the 116th. All of Morgan is in the new 112th. At present, Morgan is divided between the 113th and the 112th. As a result of redistricting, Madison County will be split between the 32nd with Franklin and Hart counties and the 33rd with Elbert. That situation is unchanged from present. Madison is in the 29th with Franklin and Hart and and the 30th with Elbert County. Elbert County, which actually lost population, is whole in the 30th House District at present and will be whole in the new 33rd. Oconee citizens, if they actually thought much about the outcome of redistricting, might wonder what the county did wrong. The reality is that most people don’t care all that much about who represents them in the Georgia House of Representatives. Most probably don’t even know. The General Assembly controls taxes and influences spending both at the state and local level. Representatives and senators influence which road projects are funded by the Georgia Department of Transportation. When the Oconee County Board of Education wanted to change its level of pay back in 2009, it needed the support of then 113th House District Rep. Bob Smith, who would have had to introduce legislation to that effect in the General Assembly. The Board of Education didn’t get Smith’s support, and it didn’t get a pay increase. Oconee County Commissioner John Daniell said at the town hall meeting the commissioners held on Aug. 16 that he would like to consider changes to how compensation for commissioners is managed. He’ll need the support of the local legislative delegation to bring that about. That will mean the support of whoever is elected in 2012 to represent the county in House District 117, of whoever represents the county in House District 119, and of whoever represents Oconee County in Senate District 46. Because of their utilitarian origins, the first three, four and five digits of a zip code are still the most honest delineators of community boundaries. Any reapportioners who refuse to notice this should be prosecuted up to the Supreme Court and imprisoned.